The Valuation Advisors Lack of Marketability Discount Study™ compares the initial public offering (IPO) stock price to pre-IPO common stock, common stock option and convertible preferred stock prices. This study is a Web-based tool used to quantify lack of marketability discounts (also referred to as discount for lack of marketability or DLOM) and includes 12,533 pre-IPO transactions from 1985 - present. The database can be used to develop a subject-company specific discount for lack of marketability (DLOM) based on the quantitative characteristics of your subject company and expected holding period. Defend your discounts for lack of marketability with the most convincing data available. New! We've recently added 823 non-U.S. deals, covering 30 countries! 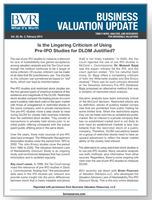 Developed by Brian Pearson of Valuation Advisors, LLC (VAL), the Valuation Advisors Lack of Marketability Discount Study is the only online database of pre-IPO private stock and option transaction data. These market based transactions demonstrate the lack of marketability discount (also referred to as discount for lack of marketability or DLOM) afforded by the pre-IPO instruments because of their illiquidity when issued by a privately held company. This study is a Web-based tool and includes pre-IPO transactions from 1985 - present including transactions with timeframes great than 2 years. Learn why you should look at DLOMs beyond 2 years. Subscribers to the Valuation Advisors Lack of Marketability Discount Study are granted access to all of the details in the database. Most companies (except partnership, foreign companies and mutual companies) that went public since 1986 and had pre-IPO transactions in their stock or options are included in the database. Gain instant access to organized, detailed, market based data that provides accurate empirical support for your lack of marketability discounts. The study is updated monthly as new companies go public; therefore, the database continues to expand with new information. By subscribing to the Valuation Advisors Lack of Marketability Discount Study, you will acquire documentation to support your business valuation reports and make them more defense proof in litigation matters. If you have any questions, please view the Valuation Advisors Lack of Marketability Discount Study FAQ (Frequently Asked Questions) page, or contact us at 503-291-7963 or via email at CustomerService@BVResources.com. Valuation Advisors Lack of Marketability Discount Study™ is a trademark of Valuation Advisors, LLC. Reproduction of this work, in whole or part, is expressly prohibited without the written permission of the author. To obtain permission, please write to the address above. Specify what data or information you wish to use and the manner in which it will be used. View Brian Pearson's complete presentation from his March 2011 BVR webinar.